They say you should never meet your heroes, but when one of them is Prince, it turns out that you probably shouldn't lend him your guitar either. 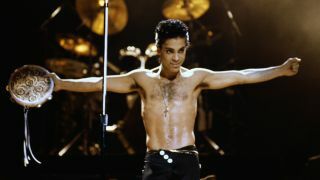 US audiences went crazy last week as they tuned in for Prince's appearance on Late Night With Jimmy Fallon, where 'The Purple One' performed new track 'Screwdriver' and 'Bambi' from his 1979 self-titled album. Prince wowed crowds at the end of 'Bambi' by hurling his guitar to the ground. All well and good, except the 1961 Epiphone actually belongs to Captain Kirk Douglas, guitarist for legendary Philadelphia live hip-hop crew - and Jimmy Fallon house band - The Roots. Taking to Twitter, Douglas posted a picture of the broken guitar caption "Purple pain. ", while noting "Maybe it's because I'm a dad but I think framing the guitar is a little like rewarding bad behaviour." Douglas went on to explain that, ironically, the only reason the guitar was at the studio that night is because he was rehearsing for a Prince tribute gig taking place at Carnegie Hall. You can watch the video at the Late Night With Jimmy Fallon website, and meanwhile we'd like to wish Captain Kirk's Epiphone a speedy recovery.